The Complete Guide to this golf paradise! The communities throughout PGA West boast their own characteristics, with many having separate amenities for their residents. There are over 5,000 homes in the development with a variety of condominiums and single-family attached and detached homes. Development took place from the original opening of the first course and has continued with the most recent neighborhood, Monterra, being in the final development phases. This allows the community to offer a myriad of home styles and sizes at a broad range of price points ($170,000 – $2,300,000). The Club at PGA West opened in 1985, with the first golf course opened the following year. While the six golf courses offer beautiful Santa Rosa Mountain views each has its own appeal. The courses are designed by golf legends and offer 109 holes. Three of the courses – Arnold Palmer, Jack Nicklaus, and Ton Weiskopf – are open to members only; members also get to enjoy a private clubhouse overlooking the 18th green of the Palmer Private Course. The other courses – Greg Norman, Jack Nicklaus Tournament, and Stadium – are open to the public and offer some of the best golfing in the country. The Greg Norman Resort Course hosts The Prestige, an intercollegiate invitational event, while the Jack Nicklaus Tournament Course and the Pete Dye designed Stadium Course co-host the PGA Tour’s CareerBuilder Challenge (formerly the Bob Hope Classic) and PGA’s final round of Q-School. The Tournament Clubhouse and the Greg Norman Clubhouse also offer guests and members dining options, lounge areas, and pro-shops. Sports memberships offer options for those who are more interested in utilizing other recreational features, such as tennis courts and fitness center, or a social membership is also available. Golf memberships start at $45,000 (non-refundable deposit) and $1,337/month. The condominiums and single-family homes surrounding the legendary Arnold Palmer’s namesake course, which is nestled along the Santa Rosa Mountains, include some of the first developed residences in the community. While a few newer single-family homes were developed as recently as 2008, the bulk of the development took place in the decade following the opening of the neighborhood. Homeowners here enjoy watching events with PGA Tour professionals the CareerBuilder Challenge from their own back yards. The gated community boasts great amenities, such as pools, spas, and tennis courts. The price range, $250,000 – $1.200,000+, in this neighborhood is fairly broad given the variety of home options. HOA fees are also varied, starting around $305±/month. Along with residences surrounding the Arnold Palmer Private Course, the community around the Stadium Course were also some of the first developed on the property. The first condominiums (1,288 sq. ft. to 3,485 sq. ft) and single-family homes were constructed in the mid- to late-80s, with continued single-family development and fill-in through 2006. This gated neighborhood also offers community pools, spas, and sports courts, as well as prime views of PGA qualifier and Tour events. Prices for properties at Stadium start around $229,000 and reach $1,650,000+. HOA fees, understandably, vary with a starting point of $305±/month. The Jack Nicklaus Private Course residences also offer condominium and single-family options. The condominiums were constructed in the early 1990s, while single-family homes were developed between 1990 and 2000. Many residences offer course views while others have off-course, private yards. Residents of the gated community can enjoy community pools and spas. Prices start around $335,000 and climb to $1,950,000+, while HOA fees start around $525±/month. 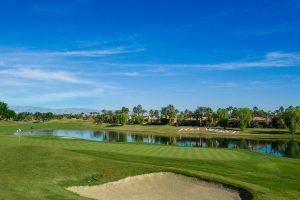 Single-family homes and condominiums meander through the Jack Nicklaus Tournament Course, which abuts the Santa Rosa Mountains and Lake Cahuilla. Development of the gated community began in 1990, with condominiums completed within the first couple years, while single-family homes continued being constructed through 2005. The community residents enjoy views of the pros taking part in the CareerBuilder Challenge and the PGA hopefuls during the Q-School finals. They also enjoy the community pools and spas throughout the neighborhood. Prices in the Jack Nicklaus Tournament begin around $170,000 and reach up to $1,650,000+. HOA dues also range from $385±/month. The gated community around the Tom Weiskopf Private Course, at the southernmost portion of the community, offers only single-family designs ranging from 2,100 sq. ft. to over 6,000 sq. ft. Homes may have golf course views or private, off-course yards. 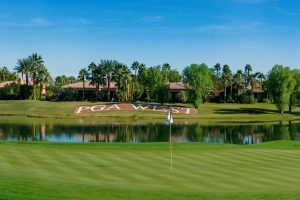 A separately gated, 17-home enclave known as Peninsula Park is part of the larger PGA West Tom Weiskopf community. These residences include additional seclusion and ample lot sizes. Prices in Tom Weiskopf begin at $350,000 and span to $2,250,000+. HOA dues begin at $305±/month. The Legends gated community totals 625 single-family homes situated along the Jack Nicklaus Tournament Course and the Tom Weiskopf Private Course. The single-story homes were constructed between 1999 and 2006, with floor plans ranging from 2,220 sq. ft. to 5,312 sq. ft. The community also offers a pool and spa. The price range in Legends starts at $750,000 up to $1,800,000+. HOA dues begin at $425±/month. The 180 single-family homes in the Greg Norman community are accessed via a guard gate along Madison Street. These homes were built between 2000 and 2005 with golf course or off-course, private back yards. The Greg Norman course enjoys its own clubhouse, making this small neighborhood relatively private. Home prices begin at $800,000 and climb to $1,900,000+. HOA dues range from $525±/month and include front and rear yard maintenance, making this neighborhood a great option for those who travel frequently or make this golf community a seasonal home. The Signature neighborhood is nestled in the heart of the community boasting 230 residences. The community of Spanish and Tuscan-style homes broke ground in 2015 and is sold-out. Villas offer an attached home options with one- or two-story layouts from 1,466 sq. ft. to 2,298 sq. ft. Single-family detached options with one or two-story layouts are offered by smaller Haciendas, 1,941 sq. ft. to 2,429 sq. ft., and larger Estates, 2,528 sq. ft. to 3,479 sq. ft. The community features private club house, with amenities such as a fitness center, pool, bocce ball court, and full kitchen. Home prices in Signature range from $265,000 to $775,000+. HOA dues start at $365±/month. The newest community is Monterra, adjacent to the Greg Norman Course. The 39 single-family residences enjoy large lots and floor plans with ample outside living space. The homes were designed by Hannouche Architects and are being developed by Woodbridge Pacific Group. Exteriors feature Tuscan and Spanish designs and every home has a pool and spa. The four available floor plans range in size from 3,180 sq. ft. to 3,642 sq. ft.
Prices from the new homes begin at $600,000 and go up to $800,000+. The final option offered to those considering The Residence Club. This community offers 20 fractional ownership villas and 12 exclusive, full ownership homes known as The Collection at The Residence Club. These residences come with a variety of available benefits and services such as an included Premier Sport Membership to PGA West and concierge services. As ownership options for The Residence Club are not publicly available, please contact one of our real estate agents for pricing and details.